guide on using textures, v.2 - Helping icon makers one tutorial at a time. There will a lot of examples, so expect this to be very image heavy. Textures that aren't credited are my own. Icons are made with Photoshop CS2, but all techniques are translatable to other programs. 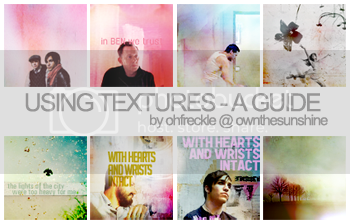 A lot of you ask questions about how I use textures and requested a new guide, so here it is. I already wrote one almost two years ago, but my style and taste in making icons has changed quite a lot since then, hopefully for the better. There is nothing ground-breaking here, since there are other guides like this. But as someone who makes their own textures, always with an eye on usability, I may have a different approach than someone who only applies the textures. To make it short, hopefully this will be useful in one way or another. I'll provide .psds with these icons. They will only contain the layers you need for this guide: textures and brushes, so you can see where I erased and masked and layers that adjust the contrast. Otherwise the bases are finished and already coloured. If one of the layers says 'merged', I used copymerged all the layers beneath (Ctrl+Alt+Shift+E). If you have further questions, want a full icon tutorial for one of them or need the original image, just ask. I'll do what I can to help. Textures are not meant or needed to be used as is. They are a material that you can change according to what you need. Experiment with settings and opacities, an effect that looks awful with full opacity might look great at 50%. For using textures as backgrounds you need to have the subject extracted, either masked and transparentor on a plain background. Only that way you'll get the full effect, everything else would look cluttered. For the purpose of this guide I'll assume you know how to to extract your subjcet. I'll go into further detail about that and the techniques I use in the upcoming Guide on Negative Space I'm working on, since it's a main topic there. If you don't know how do it, shoqolad has some good tips here. 1. Use a layer mask to extract the subject and make the background transparent (I have a brief explanation about this technique in this tutorial). 3. After adding some brush strokes (see psd), duplicate the texture, put it on top and lower the opacity to about 25%. It decreases the contrast and adds some of the same colors as the background to their shapes. 4. Add text and play with brightness and contrast. 1. The base is colored and has a smudged background. 2. Paste the texture and set it to linear burn. Add a layer mask and with a rough brush make a dark grey stroke over his face, that way you'll lower the opacity of the textures where you painted. The darker the color, the more you decrease the opacity, black would make the masked parts completely invisible. Make a second stroke on the mask in a light grey on the left. It increases the lighter part in the texture, and it adds an interesting effect. 3. Add text and play with brightness and contrast. Another example with a masked transparent background. Here I used Autolevels on the texture by piemin to change the color and smudged the parts I didn't want. To simply color an icon you can use every texture that has no busy patterns like circles or stripes. Best suited are cloudy or softly colored textures, new ones are posted almost daily on icon_textures. This technique works best on bases with a light background. You can also use textures instead of color layers. I suggest you experiment here what suits you. For example, instead of a simple light blue burn layer, try a cloudy sky texture on color burn, it will have a much more interesting result. A texture by urbanstrokes, set to Multiply 100%. For the final result, copymerge everything twice and set the layers to soft light. 1. The base has a smudged light grey background. 2. A texture by innocent_lexys, set to Overlay 100 %: Overlay brightes the images and adds the color of the textures. It's similar to Soft Light, but with a stronger effect. Add a layer mask and paint over his face, the texture is too strong there and makes his face red. 3. Duplicate the texture, lower the opacity to 35%. 4. For more contrast and texture, add a grungy texture on Color Burn 100%. A texture by _iconographer, set to Soft Light. Simple, but effective. 1. Add some texture and sky with a cloudy texture. I changed the color of the original to blue and smudged the parts at the bottom. 2. Another texture by innocent_lexys, flipped vertical, set to Color Burn. The result is very dark, so dupliacte the base, drag it on top and set it to Soft Light. This works better than just decreasing the opacity of the texture, because the white part on the left of the base will lighten the icon, and at the same time the layer adds more contrast. 3. A light texture, set to Screen. It adds the purple part over the trees, and the white blob in the right corner. 4. Copymerge everything, desaturate and set to Soft Light for more contrast. The changed color is achieved by a Color Balance layer, that's included in the psd. Pretty easy, set the light texture to Screen or Lighten. If you use Lighten, the parts that aren't black will be more solid and opaque than if you use Screen. If you use light textures with large colored parts, you can at the same time add color and brighten the icon. Desaturate these textures to add a foggy effect, you can also blur them a bit. A texture by _iconographer, set to Screen. Another light texture, set to Screen. Another light texture, set to Screen. In the psd you'll see that I worked with original texture and used a b&w gradient map to desaturate the whole icon, because I never work on desaturated bases. But you can also simply desaturate the texture. A texture by mangoninja, set to Screen, partly erased. For most of these effects you'll set the textures to Multiply or Color Burn. Multiply will preserve the original structure of the texture, it will overlay your base with the darker parts, while the lighter parts will be invisible (if white) or add color (if they're lighter colors than your base). It will make your icon muted in most cases, so you might have to work on the contrast a bit. Color Burn will mostly color your base or enhance other effects and textures, and add contrast (especially when using grunge textures). Since there are numerous possibilities, I'll show just a few in the following examples. Both textures are set to Multiply 100%. They add both blue sky and a slighty feeling. For the final result I enhanced brightness and contrast by two copymerged layers on Soft Light and Screen, Curves and a Brightness/Contrast layer. Details in the psd, since they're nor relevant for the texture use. 1. A texture by aesc, used as base. I decreased the levels slightly to soften the black of the flower. 2. A texture by innocent_lexys, set to Color Burn. Color Burn on light backgrounds will only have very subtle effects. 3. Set your picture to Multiply, duplicate and set to Soft Light 55% for slightly more contrast. Texture set to Multiply 100%. It will compltely cover the white part of the base, the darker parts (Ronon) will be slightly colored. A texture by rainyrainydays. Set to Multiply 100%, it adds the stripes on top and a light blue color. I rotated the texture, used Autocolor on it for more contrast and the bluishe color. A texture by washwhendirty set to Multiply 100%, slightly smudged. The black parts cover the base completely, the grey parts mute the base a bit. Texture by set to Multiply 100%. This is a textured by brasaremean that I cropped to 100x100. It already had a transparent bacground, so I left it at Normal 100% to create some space as background for the text. 1. A cropped stock image, set to Overlay 100%. 2. Duplicate it and set it to Soft Light 100%. 3. Flatten and duplicate the icon, set the duplicate to Soft light. For a more spiffy effect, add a cropped polaroid texture on Normal 85% between the two layers, and delete the white part at the top. It adds a papery effect the bottom, and the bar in the middle creates space for text. Try and combine all the these techniques. Add brushes and text, and see what happens. There is no limit, just don't be afraid to try new things. I'll add a few .psd files in which I used most of the described effects. They have too many steps to elaborate here, but they show what you can do with textures and how I use them. Don't use these as templates, they all have numerous layer masks and will not work with other images. They're simply meant as inspiration. If you want a proper tutorial on any of these, just ask. Feel free to ask any questions. Any kind of feedback, encouragement or concrit is welcome, I'd like this to be as useful as possible. Please let me know if links aren't working. I'm mem'ing this because I really haven't gotten a knack for textures yet. thank you. adding to memories. This is a fantastic tutorial! This is great, i'm saving to mems.